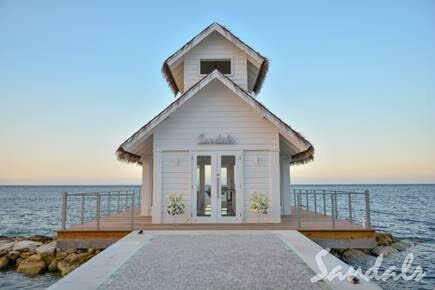 The Over-The-Water Serenity Wedding Chapels are renowned for elevating the resort’s wedding experience to unprecedented heights. These unique venues feature stunning 360-degree, panoramic ocean views and a glass floor aisle so that brides and grooms can truly walk on water on their special day. In addition to Sandals Montego Bay and Sandals Ochi Beach Resort, the picturesque Over-The-Water Serenity Wedding Chapels are also available at Sandals Grande St. Lucian and Sandals South Coast. For more information about these resorts or having a destination wedding at Sandals Resorts, contact us directly at myparadiseplanner.com/help for help from our luxury destination wedding and travel specialists. You'll get the exact same prices you see online but with our expert assistance free of charge.